Roundabout Pavement Marking Arrow Kit has everything you need to mark a Roundabout. 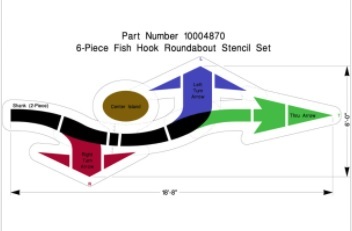 The fishhook style 6-piece roundabout arrow set allows you to add or remove arrows as needed for any particular layout. The Roundabout kit includes: (1)Two-Piece Common Arrow Shank Stencil, (1) Center Island Stencil,(1) Right Turn Arrow, (1) Left Turn Arrow, and (1)Thru Arrow. Westwind Graphics has many sizes of arrow stencils and arrow stencil kits to paint roads and parking lots to help direct traffic and improve safety. Sturdy 1/8" thick acrylic can be used over and over again. easy to clean, paint flakes off when dry.